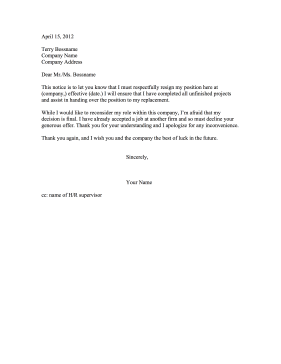 For use after a company has made a generous counteroffer, this resignation letter declines the offer due to the acceptance of another position. This notice is to let you know that I must respectfully resign my position here at (company,) effective (date.) I will ensure that I have completed all unfinished projects and assist in handing over the position to my replacement. While I would like to reconsider my role within this company, I'm afraid that my decision is final. I have already accepted a job at another firm and so must decline your generous offer. Thank you for your understanding and I apologize for any inconvenience. Thank you again, and I wish you and the company the best of luck in the future.